Sheba II was built in Earlwood in Sydney by Goldsbrough Hulls. Unfortunately there is no date of building, the only indication being the serial number on the engine which indicates it was constructed in 1955. 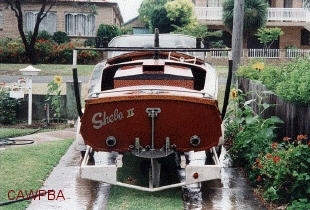 Sheba II was built as a ski boat, with a Ford 272 Y-block V8 running a direct drive to the prop. It was first owned by a local of Caringbah in Sydney's South. In 1969 she was purchased by two young brothers, who frequently skied behind her on Lake Illawarra (and I am told that she was able to pull 3 skiers out of the water at once). As these boys grew older and married, Sheba II was used less and less, living in the back of a long garage at Caringbah. Sheba II was the left unused for 25 years as the owners had families and so she sat, filled with old vacuum cleaners, mattresses, school books and piles of other junk. Sheba II was buried in years of household and garage junk, sitting behind other boats and cars and rotting from the leaking roof where the garage had been extended to fit another boat or car in a house of three boys. 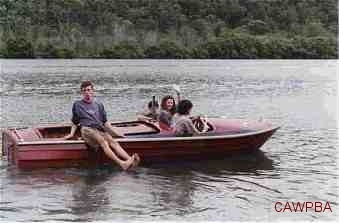 In 1997, the eldest son of one of those boys recalled seeing the boat in one of his adventurous expeditions into "Pa's garage". With his love of boats and intrigue at this old girl that was clearly a classic, he decided to do something about getting her back in the water. After completing his Higher School Certificate, four months of holidays seemed to the perfect time to have a shot at making something of this fine old craft. After about a week moving junk out of the garage, including cars, boats, wood, engines, cladding etc, and some trailer work, the boat saw daylight again. Unfortunately the rot in the deck and gunwales from a leaking garage roof was pretty serious and so a shipwright was sought out for assistance. At this point it was all or nothing, to fix the rot required serious cutting and replacing so that if it went ahead, the job was now going to be a proper restoration. And that was where it began. The engine needed to come out, many roves tightened and replaced where broken. The front of the deck was removed and replaced with similar plywood and the top of the planks where the rot had crept down were cut and fitted with new sections. Also, new beech gunwale strips were steam bent and fixed to the edge of the deck. The arch supporting the ski pole was found to be broken in three places and was replaced with a new beam and double thickness decking. The very ugly and rotting floor boards with vinyl veneer were replaced with solid pine boards with non-slip additive in the vanish. Similarly the rotting seats were removed, new ones cut and painted and then re-upholstered. The cracked plastic and aluminium windscreen was removed and the aluminium trim on the internal edge of the deck that came off a 1960's table was replaced with solid beach wood trim. The rusted ski pole, name plate and every other chrome fitting on the boat including the cavitation plate and rudder were re-chromed. The prop and shaft were removed, and reconditioned by another Caringbah local, the grandson of the original prop maker. The inside of the hull was hand sanded and re-varnished and the boat turned upside down to sand and epoxy fill the outside of the hull. With this completed, the boat was spray painted in the original colours (computer matched), as was the engine box after some reinforcement. Turned up the right way again, the deck was sanded, filled and sprayed. The engine was carefully placed back in the boat and after an oil change, new spark plugs and quite a bit off turning on the starter with the plugs out, it again fired back into life. The boat had it's post-restoration launch in March 1998, and many turned up to see the fine craft in action again, although a blown head gasket revealed itself after a while of running. This has since been repaired, but the gorgeous old trailer with "Sheba" foot holds on the wheel covers had to be replaced all together as the water pipe construction had rusted from the inside out, beyond all repair. The restoration is complete but the task never ending, with water pump seals a current problem and parts always scarce. She is however, a fine old girl who has been restored to her former glory and saved for the enjoyment of another generation of boating at the very least.